There is supercool offer from BookMyShow. This time the offer is for Vodafone Maharashtra And Goa Customers. 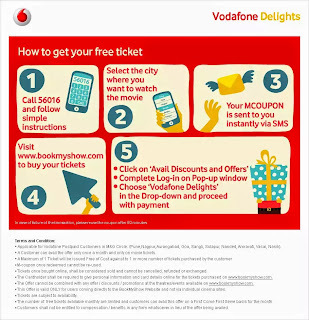 Vodafone has temed with BookMyShow to bring you the offer. The offer is that Get Book My Show Buy 1 get One Movie ticket for Free. This offer is very long term and can be availability once per month. Just read the Terms below for better knowledge. 1. To Generate the M-coupon, customer needs to call 56016 and follow the instructions. 2. Within some short time user will get 6 Digit Mcoupon Code. 3. The M coupon is valid for 12 hours only from the time the customer gets the SMS. 4. The code is important thing which you have to use later on. Follow the regular ticketing flow by selecting the movie, cinema and show of your choice.Enter your Email ID & Mobile number, as this information will be used for confirming your transaction. The customer should enter the same mobile number in "My Details" page that he has used to get his M coupon code. Select any payment option from the available payment options list. If your card is already shown in the QuikPay screen, just select that and enter your CVV. You will see the list of Offers. 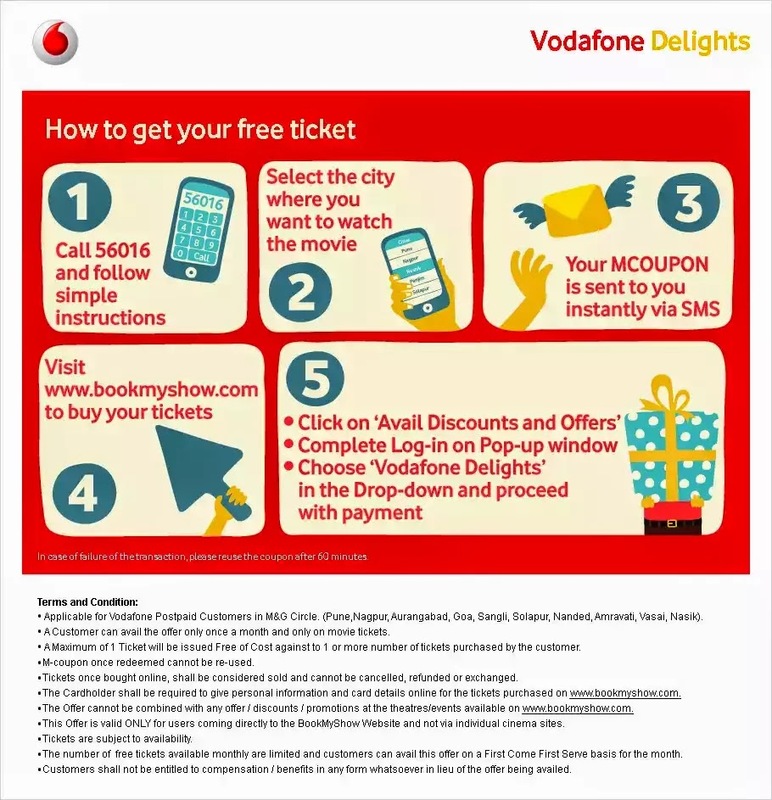 Select Vodafone Delight Offer from the list and enter "6 digit Mcoupoun" click on the 'Apply Offer' button. Congratulations! You have successfully availed your offer. *Applicable for Vodafone Postpaid Customers in M&G Circle. (Pune,Nagpur, Aurangabad, Goa, Solapur, Nanded, Amravati, Vasai, Nasik) for select cinemas. *A Customer can avail the offer only once a month and only on movie tickets. The Vodafone Offer can be availed on any day of the week, however the movie tickets can be purchased only for the Tuesday show. *A Maximum of 1 Ticket will be issued Free of Cost against to 1 or more number of tickets purchased by the customer. M-coupon once redeemed cannot be re-used. *Tickets once bought online, shall be considered sold and cannot be cancelled, refunded or exchanged. *The Cardholder shall be required to give personal information and card details online for the tickets purchased on www.bookmyshow.com. *The Offer cannot be combined with any offer / discounts / promotions at the theatres/events available on www.bookmyshow.com. *This Offer is valid ONLY for users coming directly to the BookMyShow Website and not via individual cinema sites. The number of free tickets available monthly are limited and customers can avail this offer on a First Come First Serve basis for the month. *Customers shall not be entitled to compensation / benefits in any form whatsoever in lieu of the offer being availed.